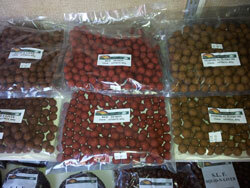 We can now offer a selection of our own baits at very reasonable prices. Our boilies can be purchased in quantaties from as little as 400g and up to 25 kilos or more on request, and we have a range of pop ups to compliment them. Also a variety of pellets are available. Take a look in the onsite shop. Copyright© 2015-2020 Stanwick Lakes Fisheries - All rights reserved.